The half-timbered houses on Bäckerbreitergang belong to the last remnants of the densely populated Gängeviertel, where from the 17th century residential quarters for the lower strata were built. When the remnant of the Gängeviertel that had survived the war and demolition was slated to disappear under a wave of new construction in the 1960s, the Bäckerbreitergang was placed under monument protection. 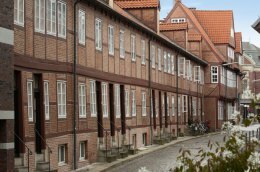 After deterioration threatened the street, it was acquired together with the main building Dragonerstall 9-13 as part of the properties owned by the Hamburg Monument Foundation. The Foundation has since been restoring the houses in a professional manner, and maintaining the area as low-price inner-city living space. The street section Nos. 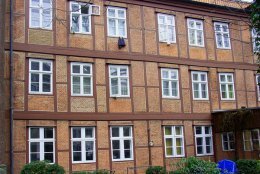 51-58 was constructed in the 18th and 19th century in typical traditional Hamburg timber-framed construction as an area of small ground-floor and second-floor apartments to accommodate the poorest strata of society. The typical picture thus came into being: three entrance doors one next to the other, leading directly into the ground floor apartments, or through a central door over a narrow staircase to the hall on the first floor. The street paving indicates just house narrow the street was in earlier days. 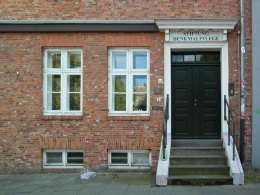 The office of the Foundation is located in the late Baroque building at Dragonerstall No. 13.